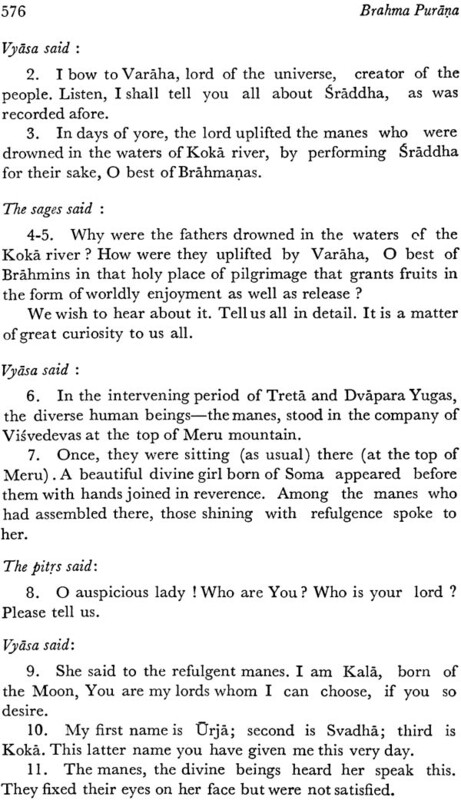 The present volume contains the Brahma Purana Part I (Chapters 1-40) in English Translation. This is the thirty third volume in the Series on Ancient Indian Tradition and Mythology. The project of the series was planned in 1970 by Lala Sundar Lal Jam of Messrs Motilal Banarsidass, with the aim to universalize knowledge through the most popular international medium, viz. English. Hitherto the English translations of nine Purãnas, namely Siva, Linga, Bhagavata, Garuda, Narada, Kurma, Brahmanda, Agni and Varaha have been published by us. 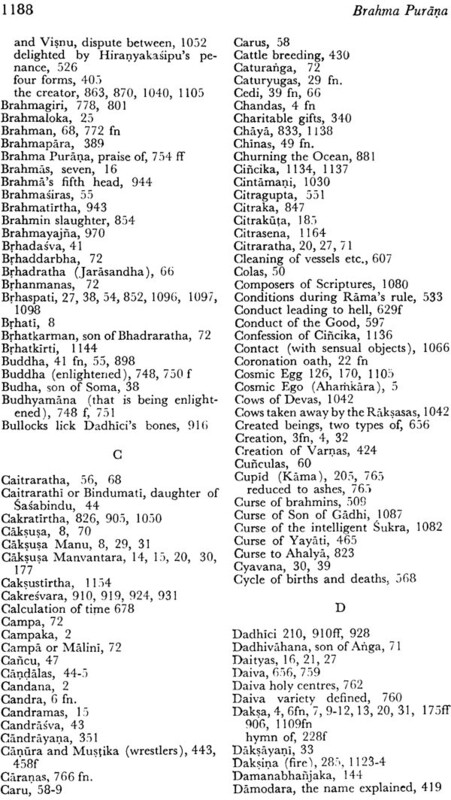 The present volume (Brahma Purana, part I) contains 40 chapters. Chapter 1 opens with a dialogue between Sutaromahana and the sages of Naimisa forest. 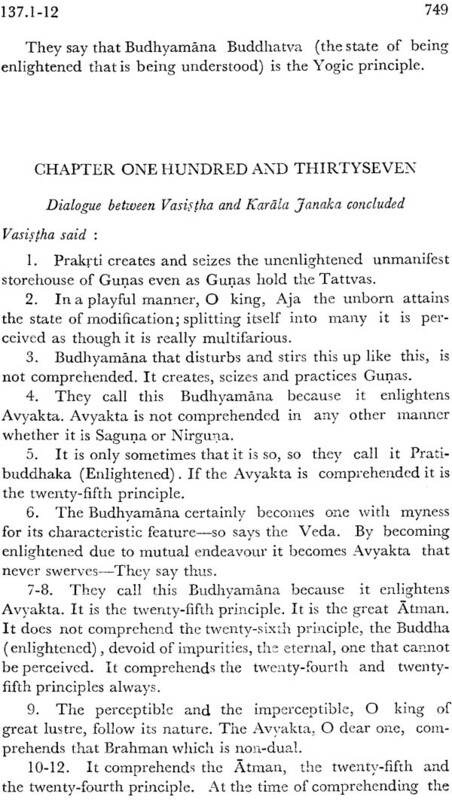 Here as usual Suta is the chief speaker who on enquiry from the sages describes, in detail, the origin of Devas and Asuras. ch. 2 narrates the birth of Prthu from Vena and his installation on the throne as the lord of subjects ch. 3 mentions 14 Manus—six in the past, one in the present and seven in the future. Chs. 4-6 review the evolution of Vaivasvata Sun and kings of the solar race. 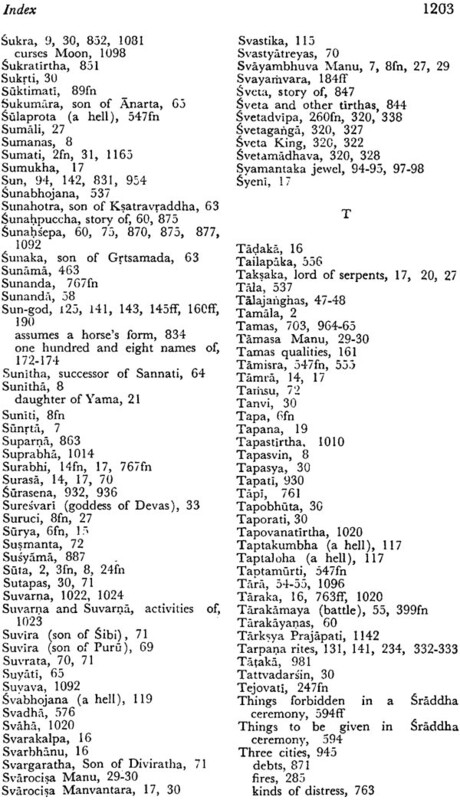 There are references to the Haihaya race which comprised the following well known tribes Vitihotras, Saryãtas, Rhojas, Avantis, Tunçlikeras, (or Kundikeras), Talajañghas, Rharatas, Sujatyas, Yãdavas, Sürasenas, Anartas and Cedis. 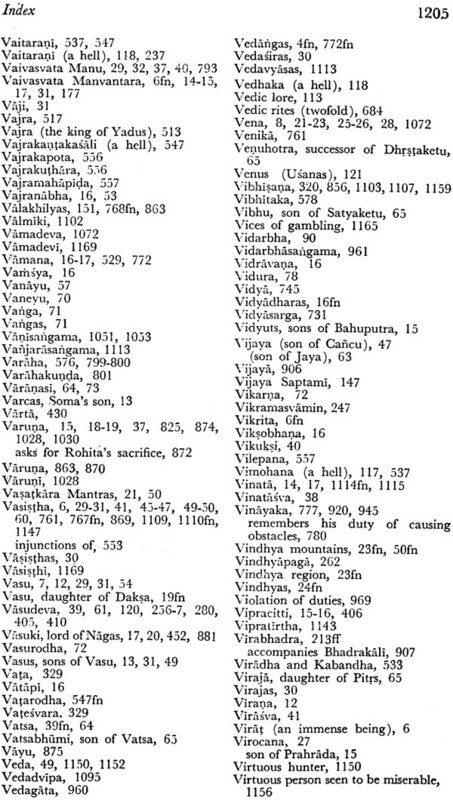 Mention is made of Sakas and Yadavas who helped the Haihaya kings in their war with Paraurama. 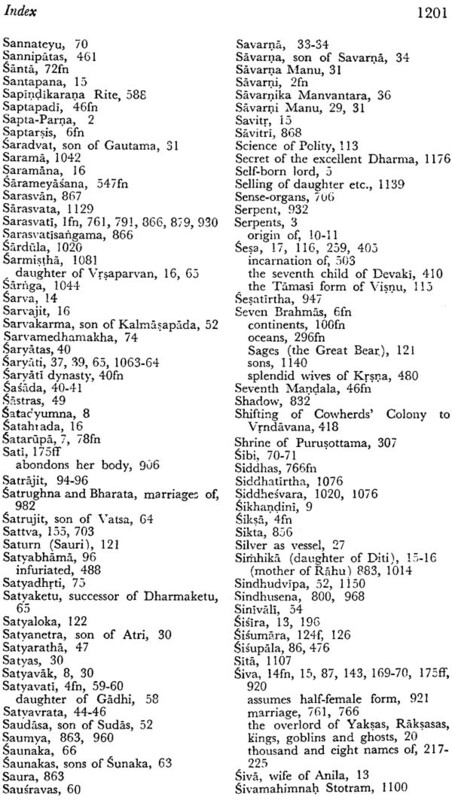 Further, references are made to Pahlavas, Paradas, Vavanas, Kambojas, Dãradas, Sakas and Cinas. 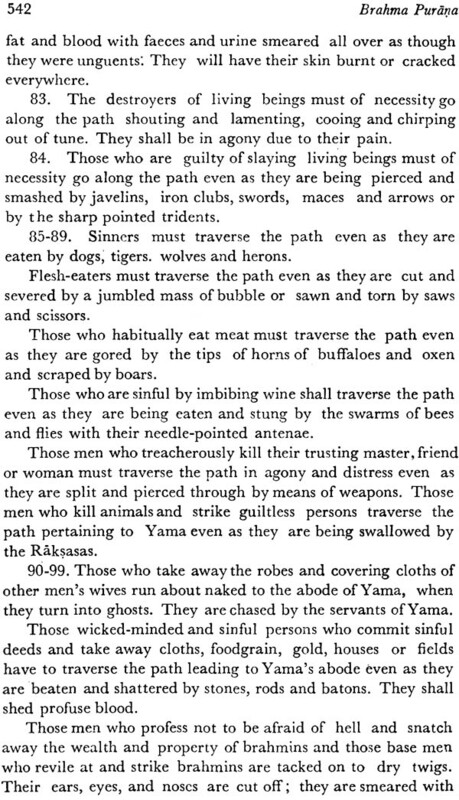 The chapter refers to some unknown tribes such as Kalasarpas and Daryas who are not identifiable. Chs. 7-8 narrate the birth of Soma and the dynasties of kings of the Lunar Race. Chs. 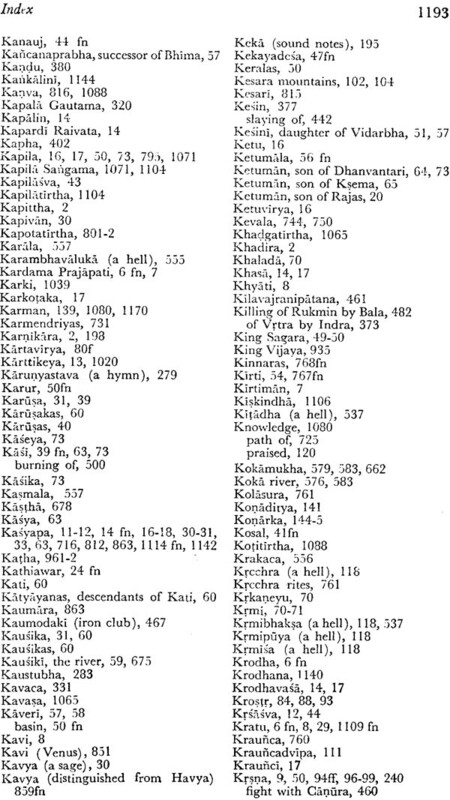 9-il recount the genealogy of ancient Ksatriyas with the narrative of king Yayati in detail. Chs. 12-15 relate to the family of the birth of Srikna in that family and the episode of Syamantaka jewel. Chs. 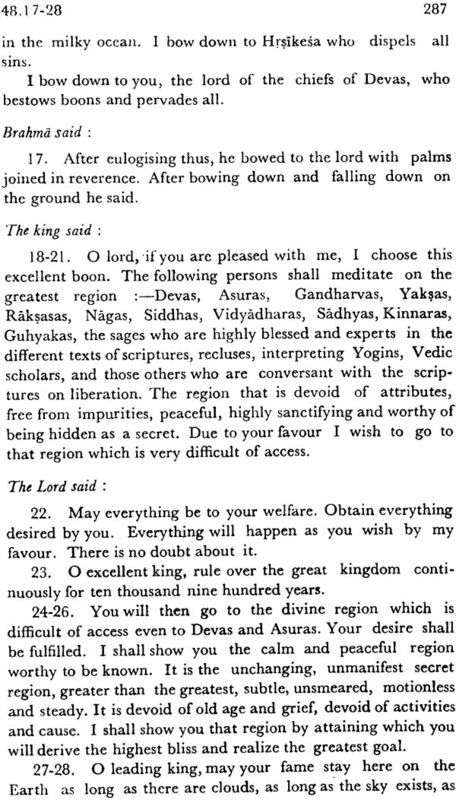 16-22 deal with the seven continents with particular reference to Jambudvipa. They survey the magnitude of oceans continents and nether regions. While describing the upper and lower worlds they present the dreadful portrait of hells as well the precise position of the pole star. Ch. 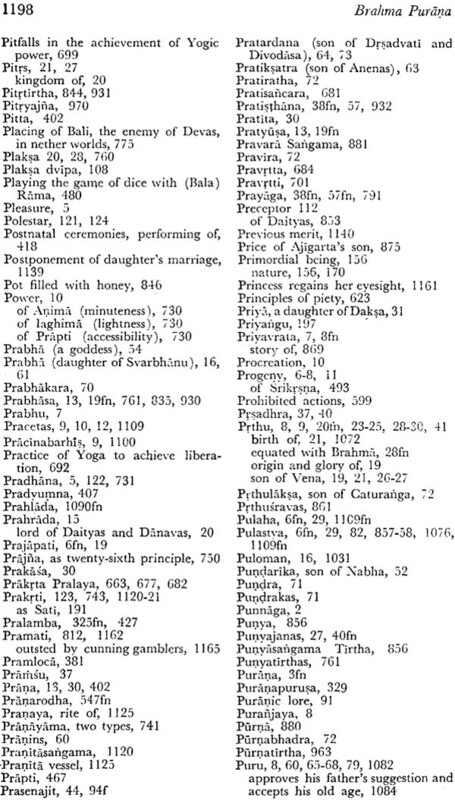 23 relates to the holy centers of pilgrimage and describes their efficacy. Chs. 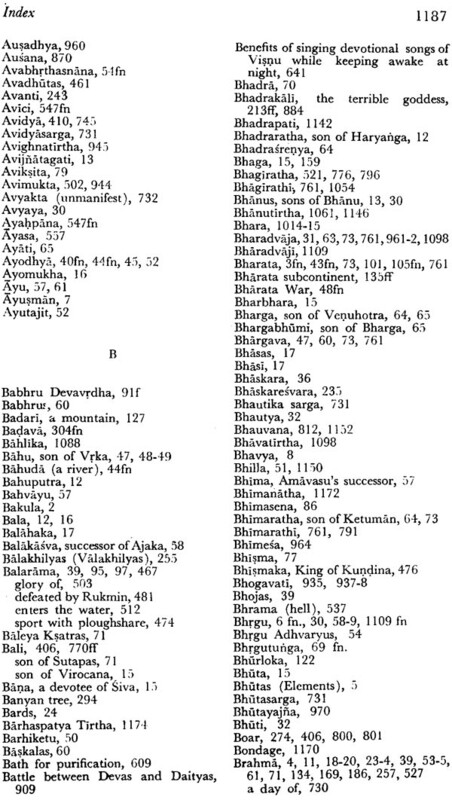 24,25 describe the glory of Bharata through the mouth of Brahma Chs. 26-31 prescribe the wordship of sun god his one hundred and eight names his glory and nativity Chs. 32-36 describe the marriage of uma-Mahesvara and their departure from the Himalayas Chs. 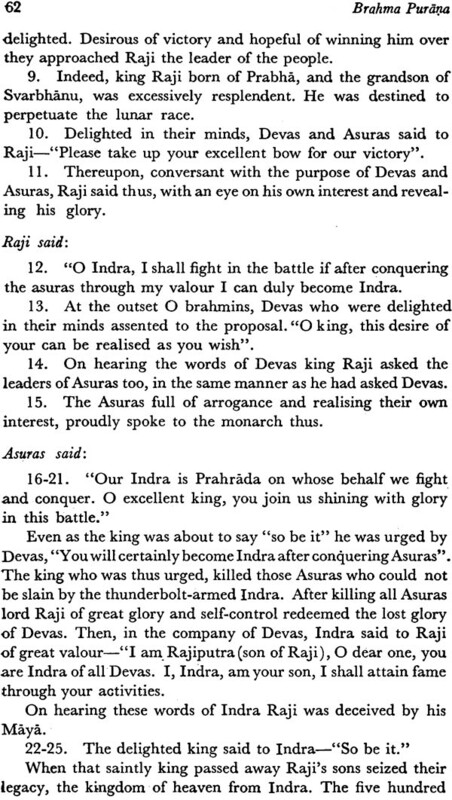 37-38 recount the story of Prajapati Daksa and the destruction of his sacrifice by the ganas of lord Siva. Chs. 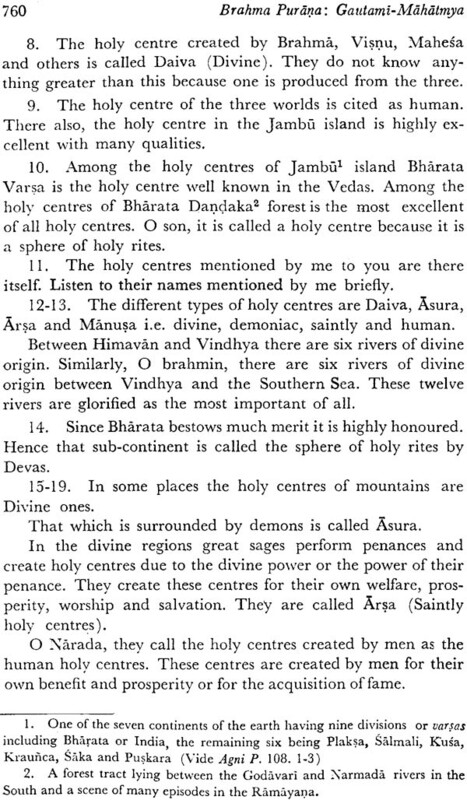 39-40 describe the holy centers Ekamra and Utkala. The Purana as a class of Literature represents different phases and aspects of life lived by the people in diverse ages. It is not possible to adopt a standard definition for the class of literature that contains heterogeneous phases and aspects of life. Literally the word Purana means old A purana in therefore the record of ancient tradition. 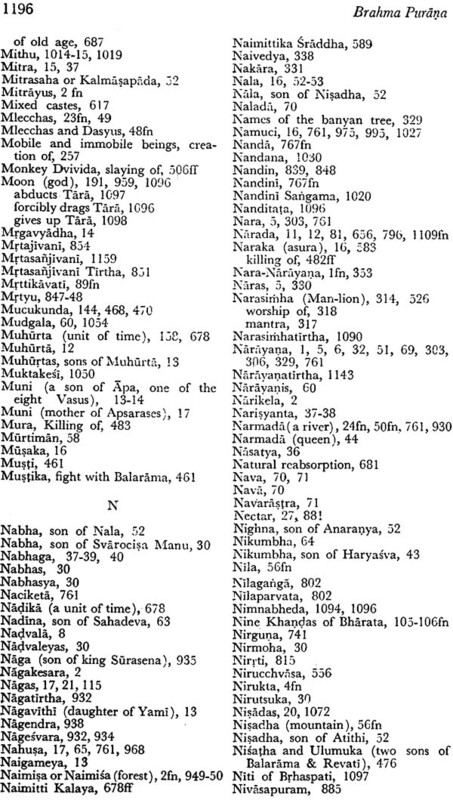 According to the lexicographer Amara Simha (c 500 A.D) a purana should treat of five subject viz creations (2) dissolution and re creation (3) Genearlogies of gods patriarchs and illustrious monarchs (4) epochs of Manus and (5) the history of ancient dynasties. 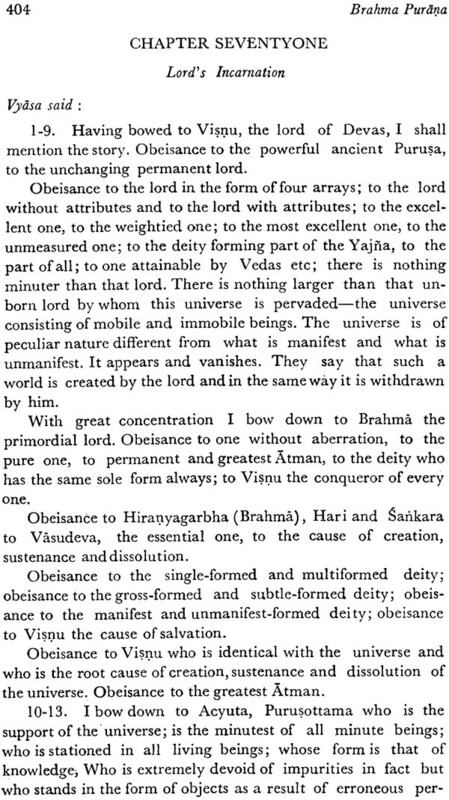 The definition is applicable to the Brahma Purana as well as to the other Puranas. 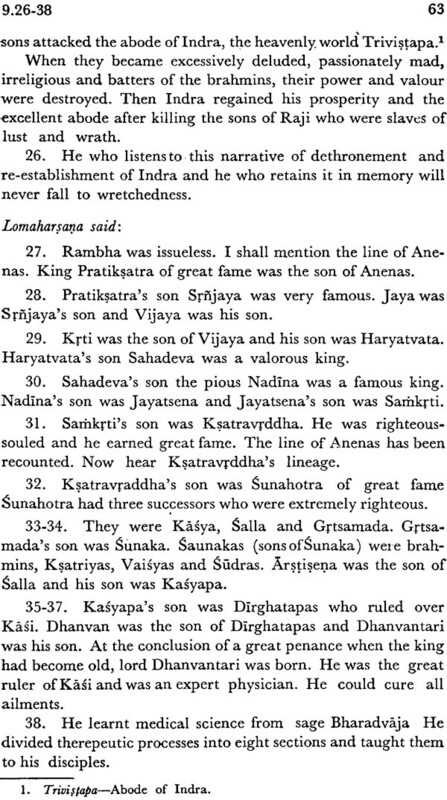 To illustrate Chapters 1-3 treat of Sarga and Pratisarga (dissolution). The latter is taken up again in Chs. 122-125 Chs. 4-11 treat of vamsa and Vamsancarita (the history of illustrious monarchs) Ch. 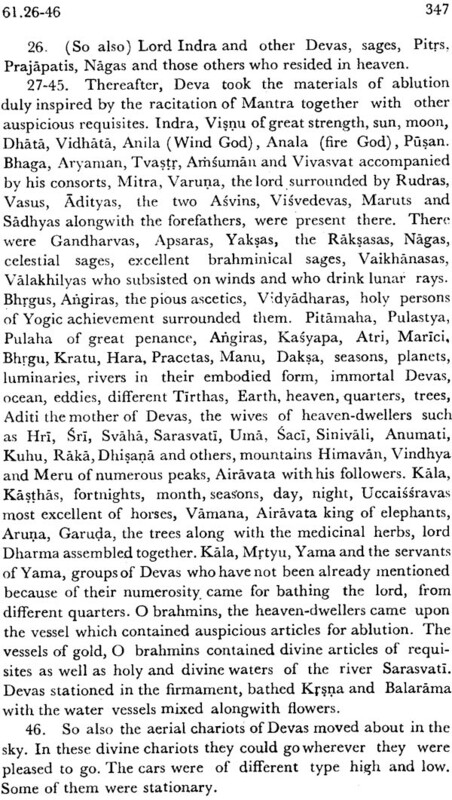 3 deals with the fourteen Manvantaras (ages of Manus) viz Svayambhuva svarocisa Uttama Raivata Caksusa vaivasvata Raibhya, Raucya, Tamasa and five savarnis surya daksa Brahma dharma and rudra. But the definition was found inadequate even in the early age of Puranas. It could not cover the entire contents of the Purana. The scope of definition was therefore enlarged even at the stage when the Purana literature was in the offing. 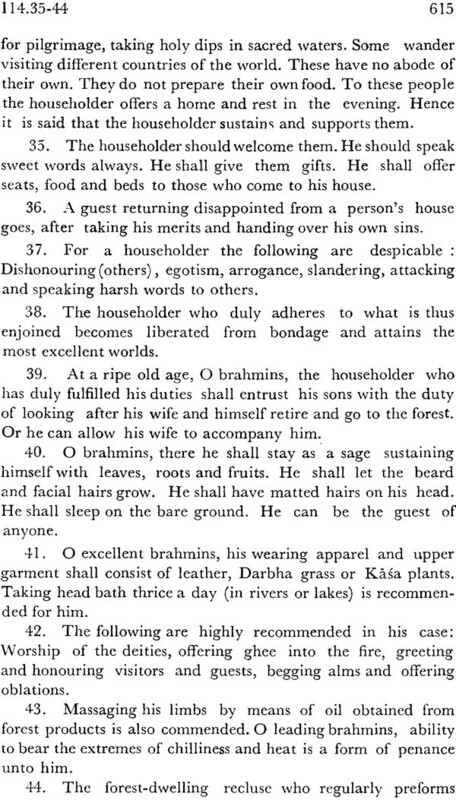 The Bhagavata Purana added five more characteristics to the panca laksana purana. They were vrtti (means of livelihood) Raksa (incarnations for the protection of the people) Mukti (final Release) Hetu (unmanifest primordial nature) and apasraya (Brahma) but even this dasa Laksana definition could not full cover all aspects. 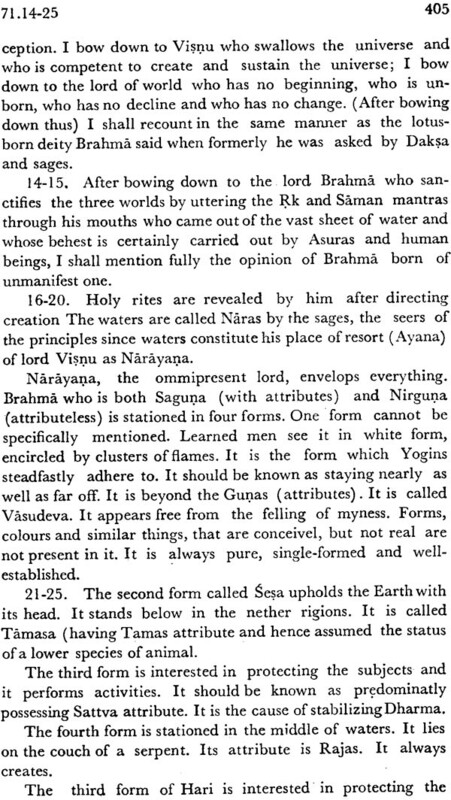 Hence the Matsya Purana provided a definition approaching nearer to the description of the extant Puranas. According to this definition the Purana included the glorification of Braham visnu Surya and Rudra as also of Dharma artha and Kama. But neither the Pancalaksana nor the Dasalaksana nor the Matsya Purana definition of the Purana could cover such topics as Tirtha yatra etc. with changes in the peoples mode of behavior the Purana introduced various other subjects which could not be covered by any definition. However this class of literature was definable only by the etymological meaning of the word Purana that is old. 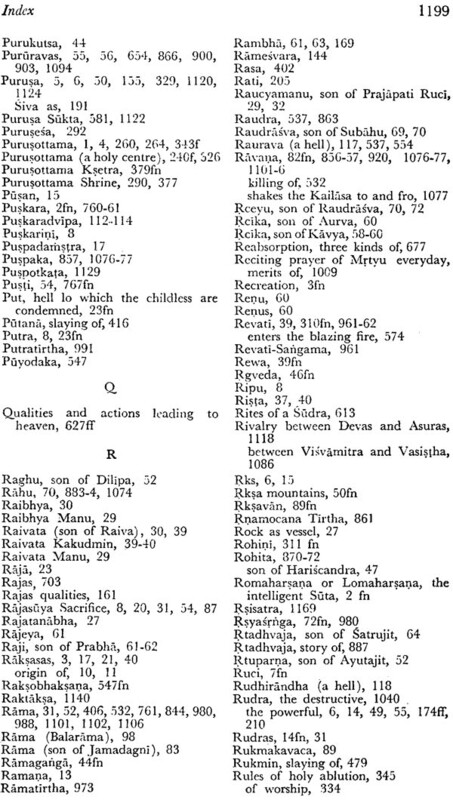 The Padma Purana classifies Brahma Purana as Rajasa and assigns it to Brahma the god of rajas quality. 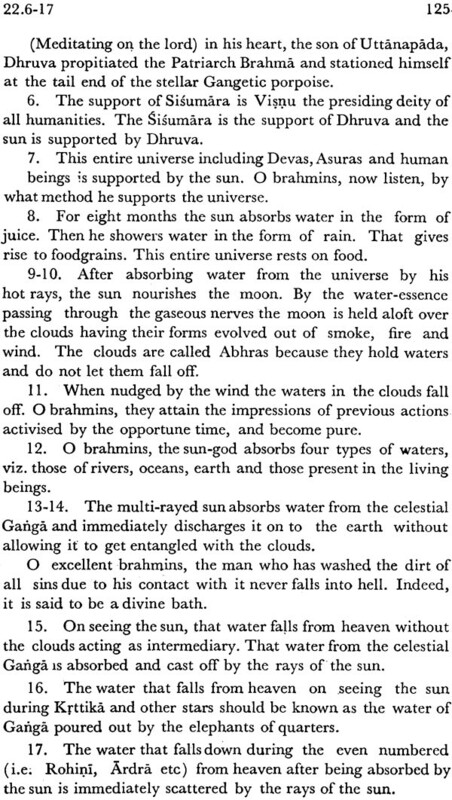 This conforms to the statement of Matsya that the Rajasa Puranas are assignable to Brahma or Agni sattvika to Visnu tamas to Siva. The Puranas are classifiable as sattvika rajasa and tamasa on the strength of quality which they possess predominantly. 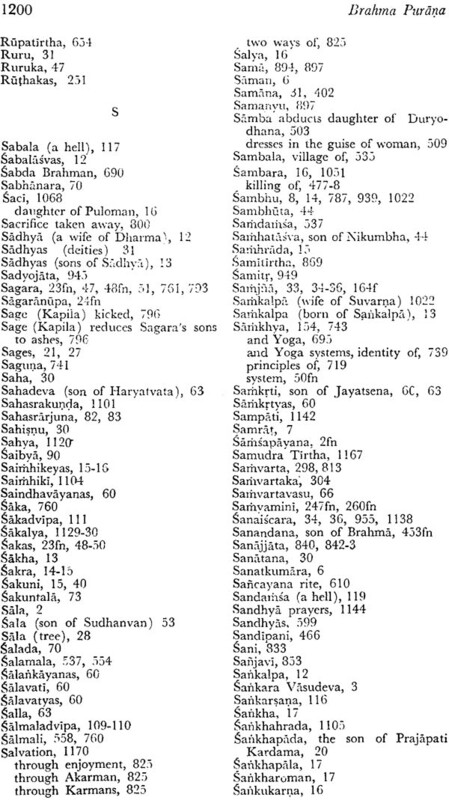 But as the study reveals the Brahma is more sattvika than rajasa. A considerable portion of this purana is devoted to the glorification of Purusottama vasudeva Srikrshna Sun god and Siva. 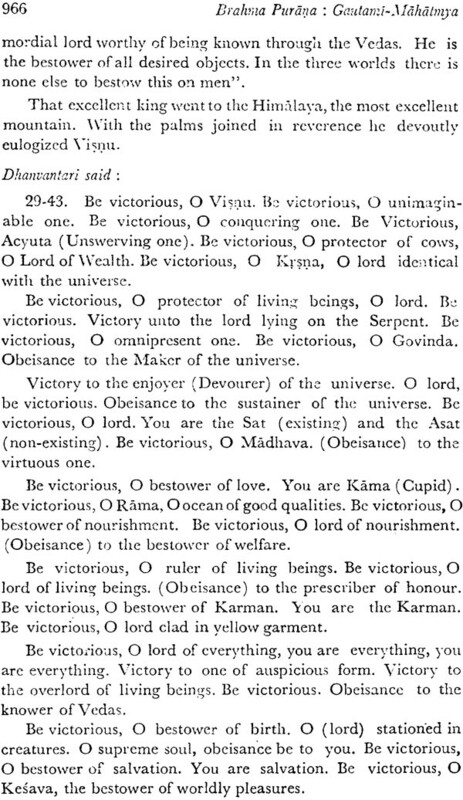 The Purana speaks of Ekama ksetra and Purusottam ksetra as sacred to Siva and Visnu respectively visnu and Siva are paramount lords while Brahma occupies the third position. 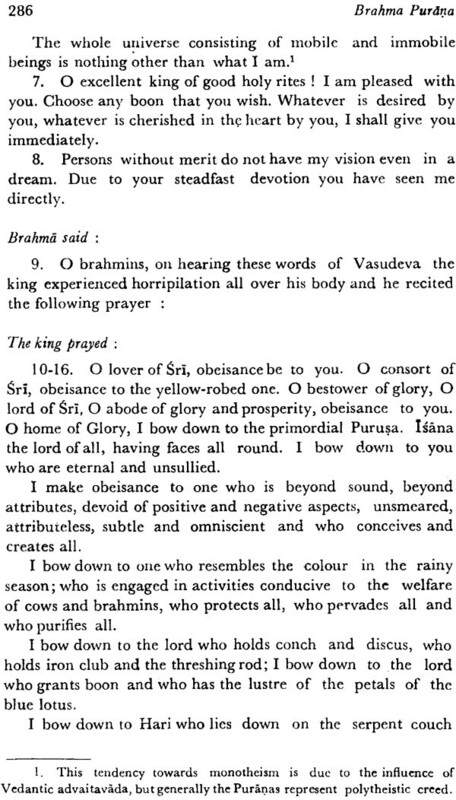 Brahma himself speaks highly of Visnu and Siva. 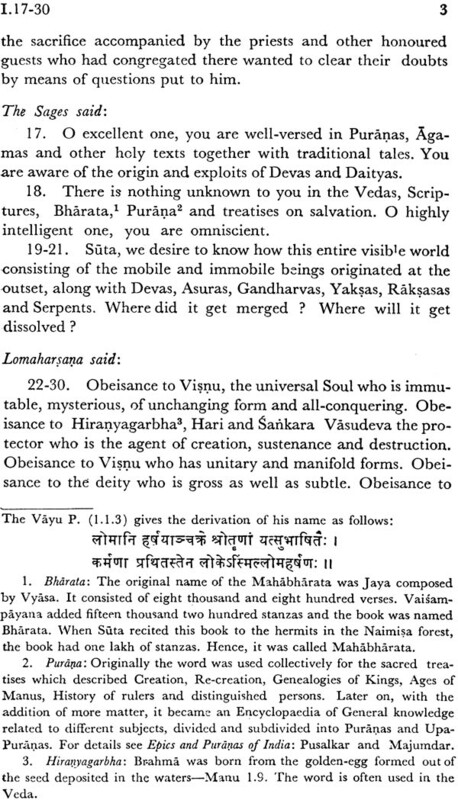 But the Purana takes its name after Brahma. It is because Braham is the main speaker here. 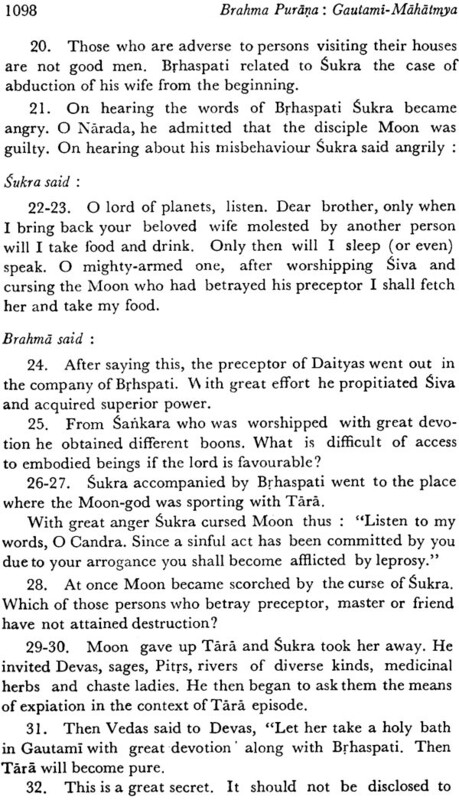 It is Brahma who narrates this Purana to the sages on mount meru. 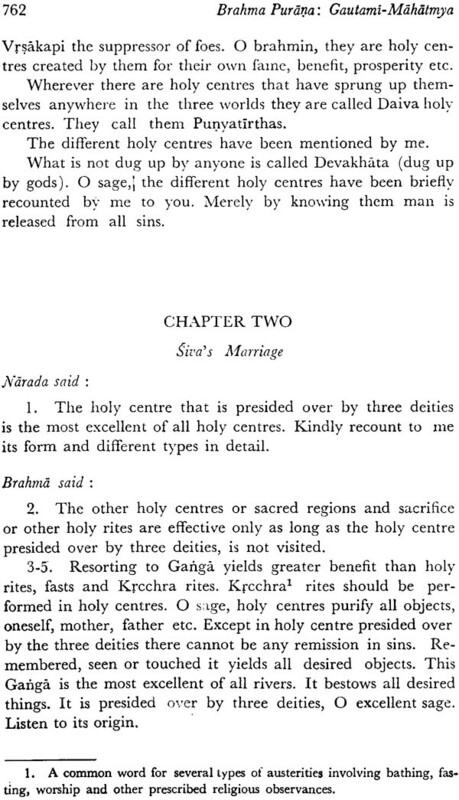 The version with certain modifications was repeated by Vyasa to the sages at Kuruksetra and by his disciple Romaharsana to the sages at Naimisa. The Purana derives its name merely because it has appeared through the mouth of Brahma. 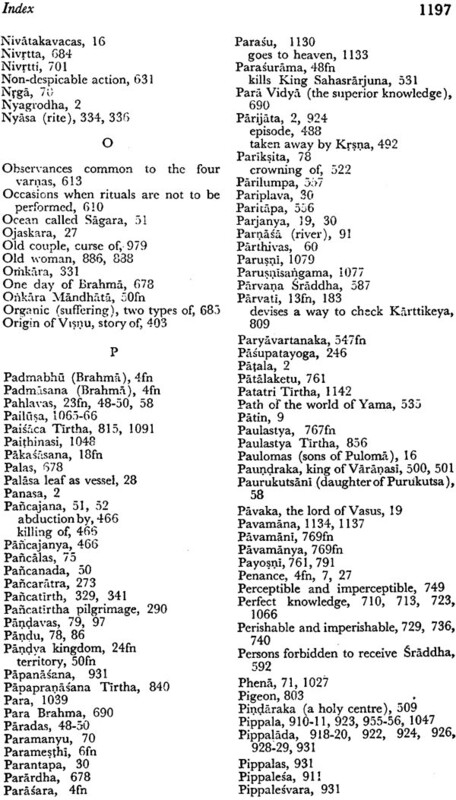 According to the Narada Purana Brahma Purana contains 10,000 verses. 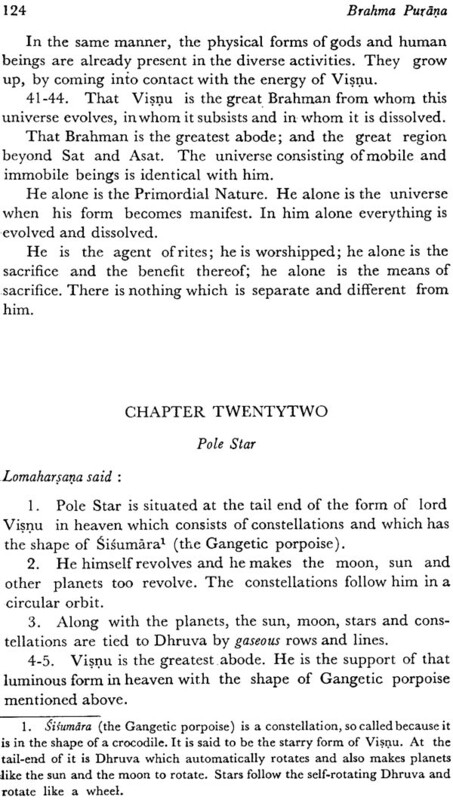 This is corroborated by Linga varaha kurma and padma Puranas. 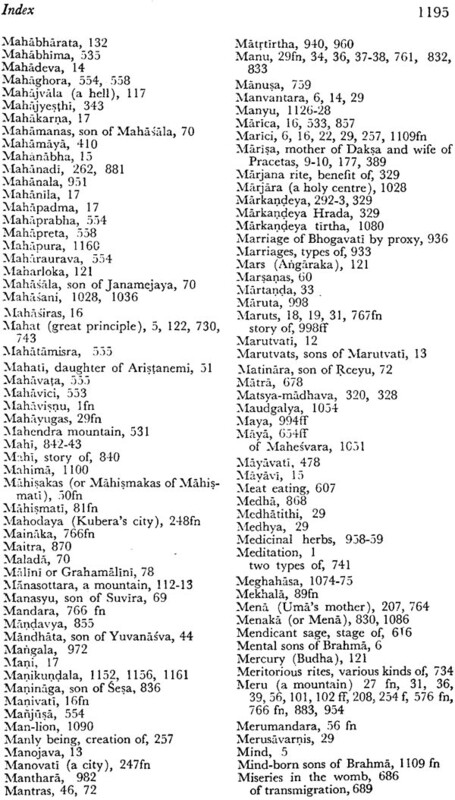 The Matsya Purana however gives the number as 1300 though some of the mss of the Matsya Purana read this number as 10,000. 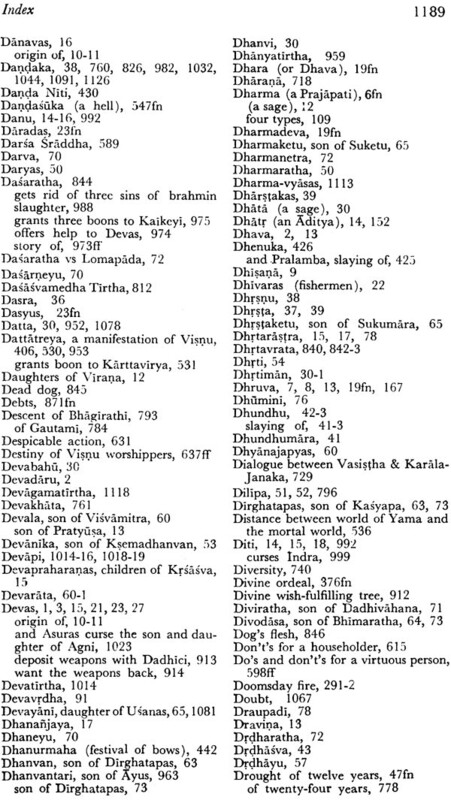 In fact if we divide the Krahma Purana into 2 parts arbitrarily (although there is no mention of this division in the purana itself) part 1 containing 138 adhyayas comprising 10,000 verses and part 2 comprising Gautami Mahatmya containing 4000 verses the number comes to 14000 verses which is supported by Devibhagavata. But whether Gautami Mahatmya is a part of Brahma Purana or an independent work has always been an open question. 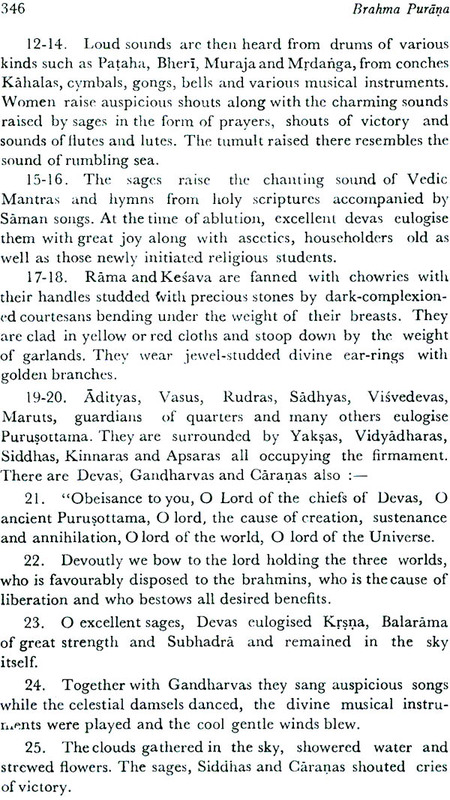 The Narada Purana excludes gautami mahatmya from the contents of Brahma Purana. 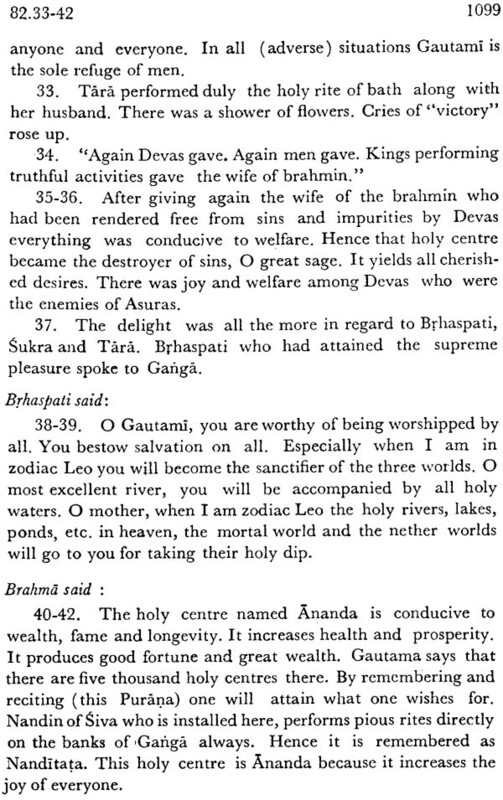 This shows that Narada Purana did not recognize Gautami as a part of Brahma Purana. 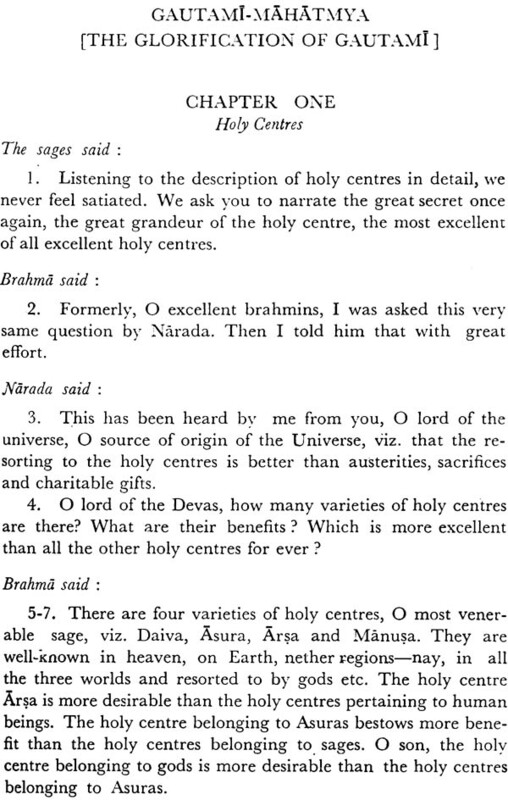 From this we can conclude that the original Brahma Purana much have comprised 10,000 verses approximately. 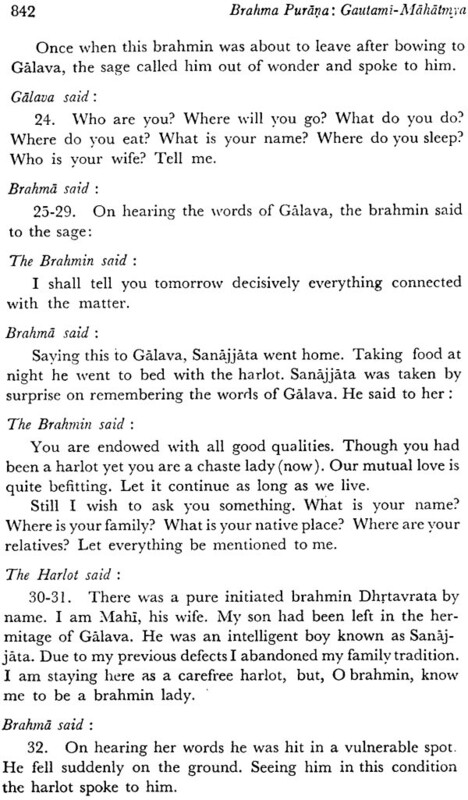 The present volume contains the Brahma Purazia Part II (Chapters 41-105) in English Translation. This is the thirty- fourth volume in the Series on Ancient Indian Tradition and Mythology. The project was planned in 1970 by Lala Sundar Lal Jam of Messrs Motilal Banarsidass, with the aim to universalize knowledge through the most popular international medium, viz. English. 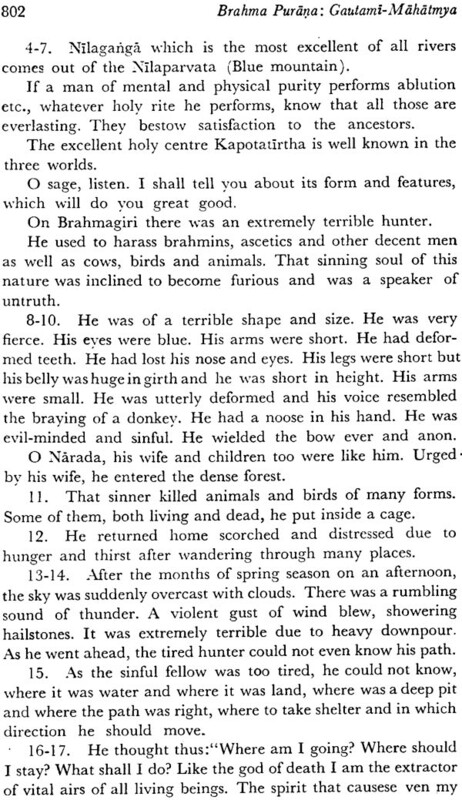 Hitherto the English translations of ten Puranas, namely Siva, Liñga, Bhãgavata, Garuçla, Narada, Kurma, Brahmaida, Agni, Varãha and Brahma (part I) have come out. The present volume contains chapters 41 to 105. It opens with the narrative of Indradyumna, king of Avanti, his performance of horse-sacrifice at the holy centre Pursottama and the establishment of images of Sankarana, Krna and Subhadra in the magnificent palace which he built there. 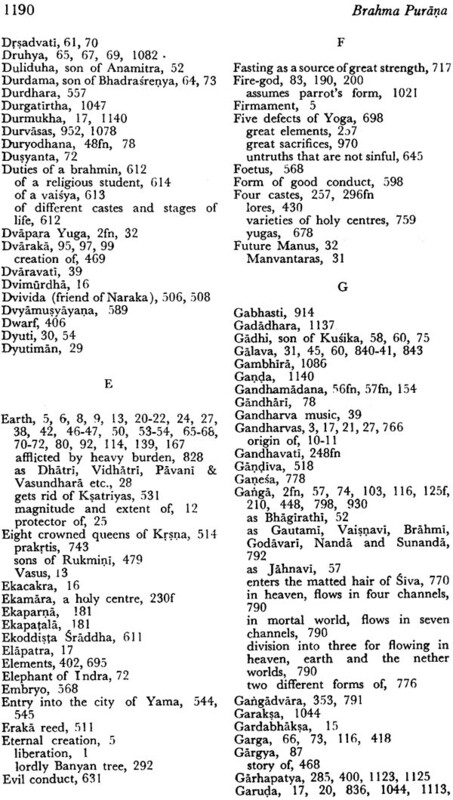 The account extends to the forty-eighth chapter ending with the description of Pursottama, the centre sacred to Vinu. 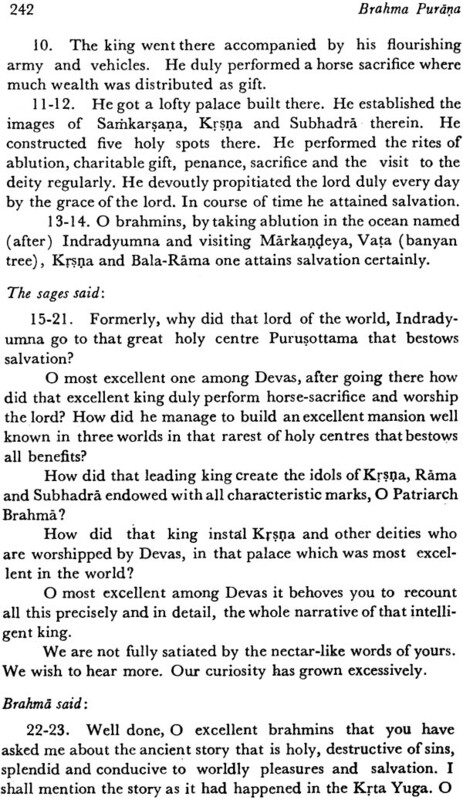 The text then passes on to the story of sage Markancleya with the significant reference to Siva’s temple by the side of Markaodeya lake which was built in AD. 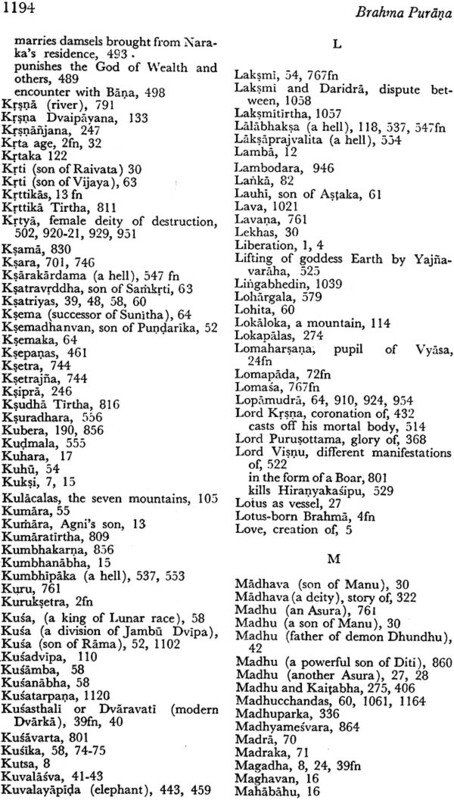 800 by Kundala Kesarin, king of Orissa. This is followed by the description of holy shrines, the procedure of worship of deities therein and the benefits of their worship. The Puraa expiates upon the merits of living and dying at this centre. 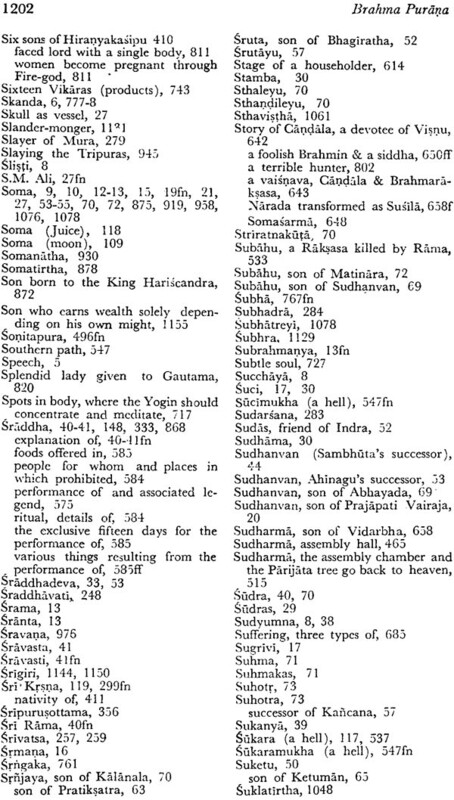 Chapters 69 to 103 describe the narrative of Sri Krçia and the legends of Balarâma, Pradyumna and Aniruddha. Chapters 104 and 105 which conclude this part glorify different manifestations of the lord as well as review the path of the world of Yama. 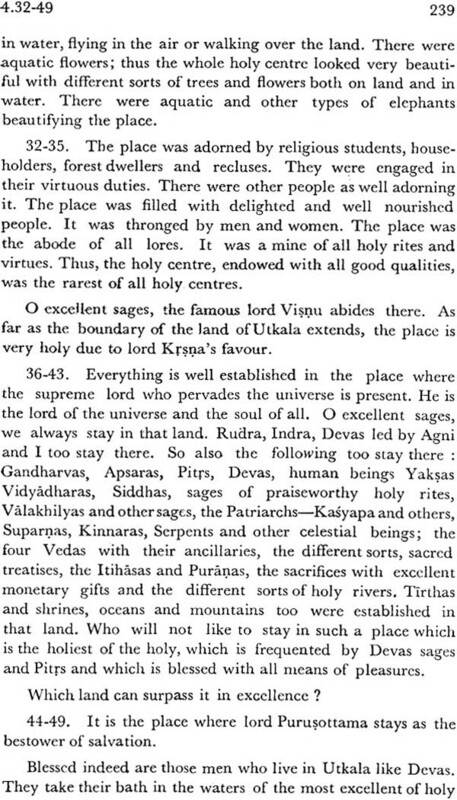 Most of the chapters in this as well as the preceding part describe the holy places of Orissa. 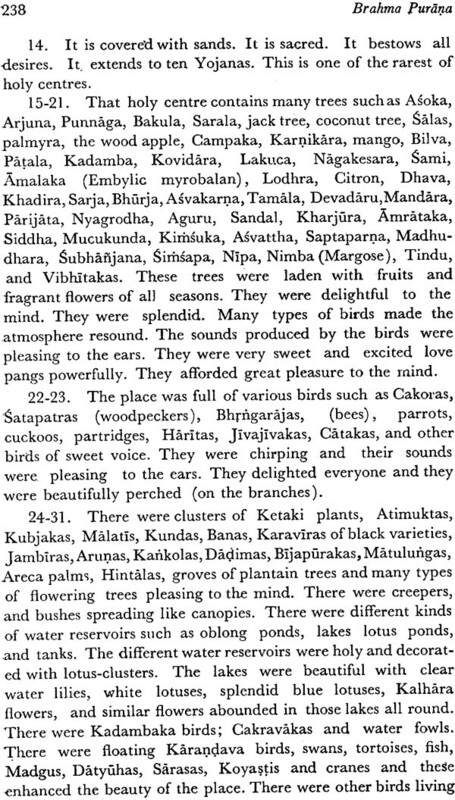 They seem to have been composed by one who was well acquainted with Orissa. 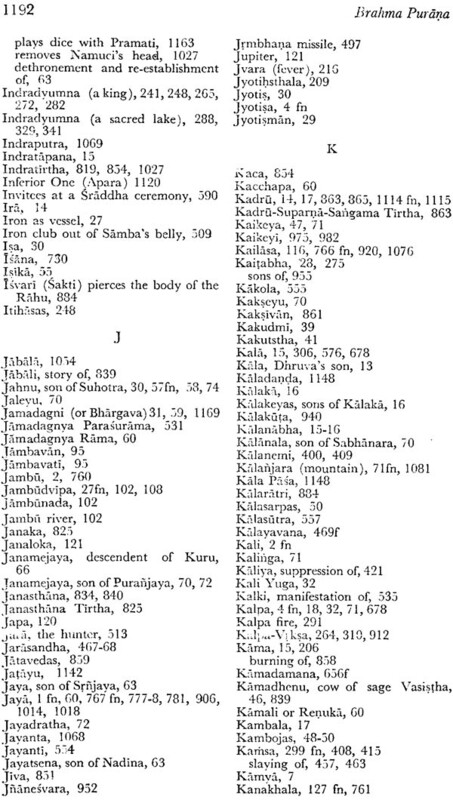 We may, therefore, conclude that the group of chapters relating to Orissa might have sprung up in that centre. It is our pleasant duty to put on record our sincere thanks to Dr. R.N. Dandekar and the UNESCO authorities for their kind encouragement and valuable help which render this work very useful. We are grateful to Shri T.V. Parameshwar Iyer for his valuable assistance in the preparation of this work. we also express out gratitude to all those scholars who have offered suggestions for improving the same. In fine we avail of this opportunity to state that any critical suggestion or advice for improvement is welcome and will receive proper consideration from us. This is the thirty-fifth volume in the series on Ancient Indian Tradition and Mythology. It contains l3rahma Purana, Part III (chapters 106-138). The project was conceived in 1970 by the late Lala Sundar Lal Jain of Messers Motilal Banarsidass with the aim to disseminate the knowledge acquired by the ancient sages through the most popular international medium, viz. English. Hitherto the English translations of ten Puranas, namely, Siva, Linga, Bhagavata, Garuda, Nárada, Kürma, Brahmanda, Agni, Varãha and Brahma (Parts I & II) have been published in the series. 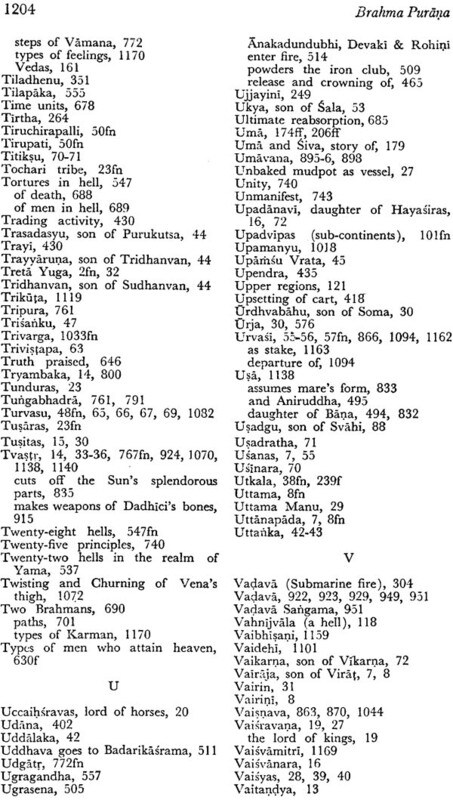 Chapter 106 opens with an account of tortures inflicted on sinners in various hells. 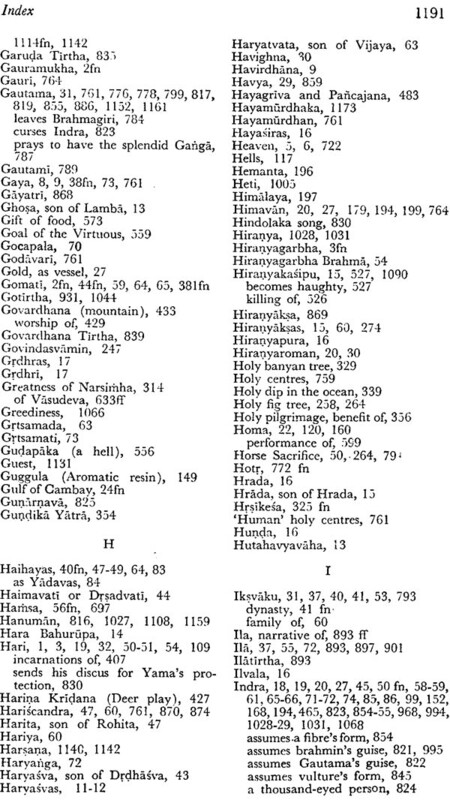 As many as forty-two hells have been named as against twenty-eight in most of the Puranas. A terrible picture of the tortures to which sinners are subjected has been drawn obviously with a motive to check the growth of crime. 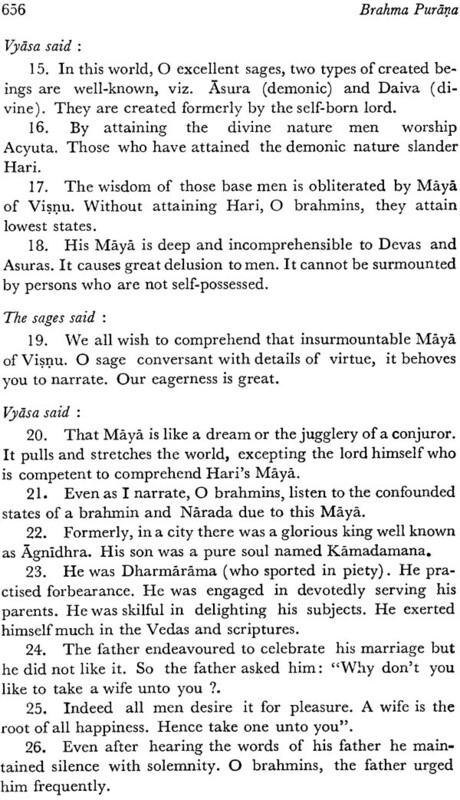 This is followed by an account of the reception accorded to the virtuous by Dharmarãja and his servants in chapter 107. Then chapter 108 describes the good and bad actions of the Jiva and the Yonis into which it is reborn as a result of them. The next chapter praises the gift of food as the best of charitable acts and then in the next three chapters details of the performance of raddha for the departed are given. Chapter 113 contains a description of compulsory and optional duties prescribed for the householder together with various do’s and dont’s. 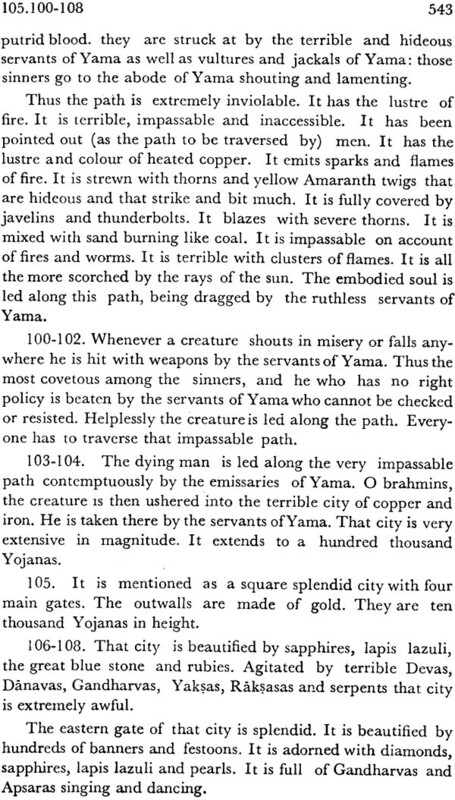 Chapter 114 describes the special duties of the four castes (varzas) and the four stages of life (dramas). The next one is of a considerable sociological interest as it specifies the circumstances leading to upgrading and downgrading of castes. Chapters 118-120 are concerned with the superiority of god Viu, his worship and the benefits of singing songs in praise of Visnu. 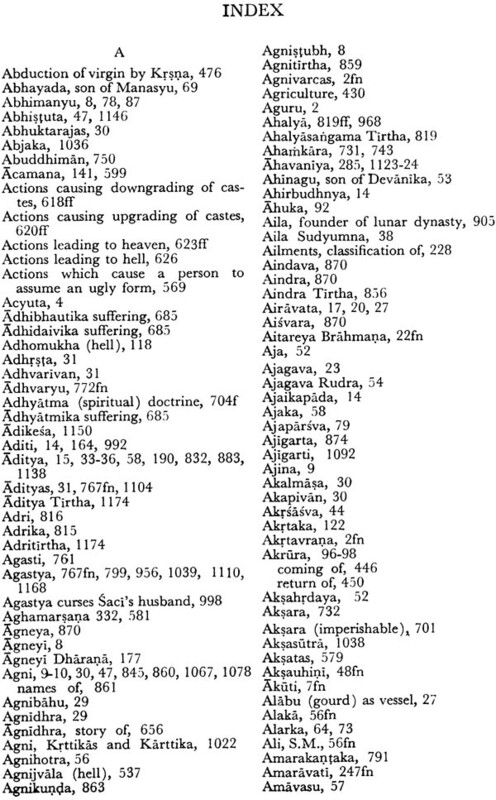 Chapters 122-23 treat of the fate of men in Kali age and ‘foretell’ in what respects righteousness will decrease what losses difficulties and calamities will befall mankind. 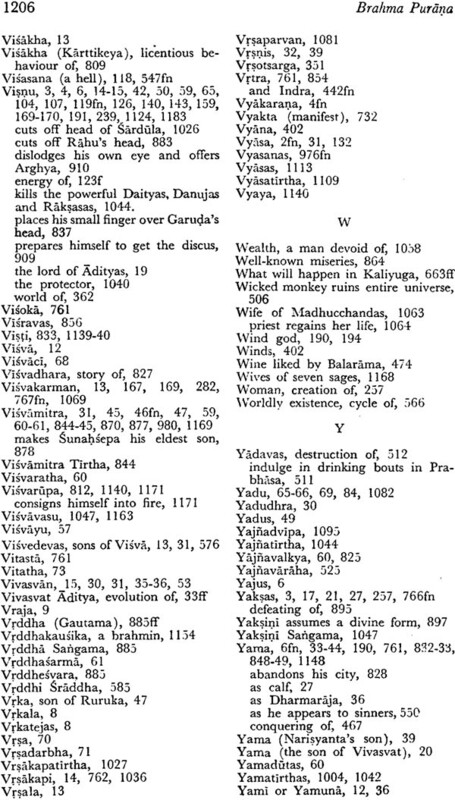 Various kinds of cosmic annihilation at the end of a kalpa etc. are described in Chapters 124-125 it is really a terrible picture that has been drawn. The subject of the next one is human suffering and the means of getting rid of it for ever. Yoga as a means of ending the miseries and various restrictions to be observed during its practice is the topic of Chapter 127. the Principles of Sankhya and Yoga are discussed in more details in chapters 128-32. Topics of religious and philosophical interest recur in the next five chapters. Samkhya concepts find a prominent place in the philosophy of this Purana. This thirty-sixth volume in the series on Ancient Indian Tradition and Mythology forms the fourth and last part of the Brahma Purana. 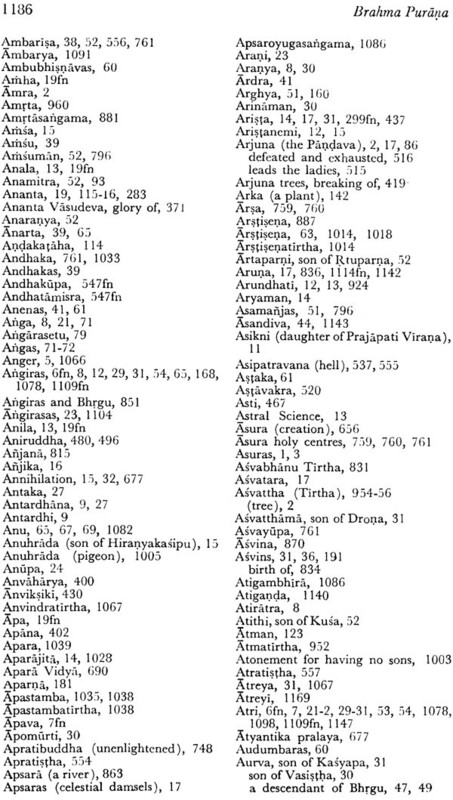 It contains the entire Gautami-Mãhatmya consisting of 105 chapters which eulogize a number of sacred places situated on the banks of the river Godãvari flowing south of the Vindhya mountain through the, well-known forest named Dasidakarauya. 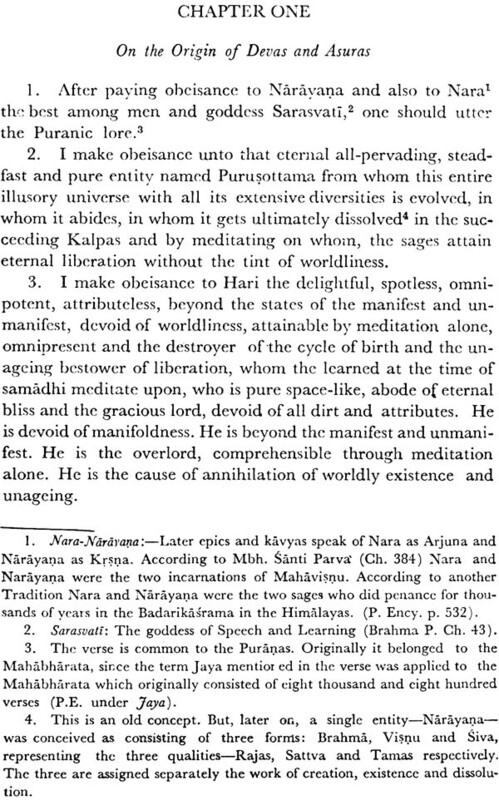 This part of the Brahma Purana is an independent work, since it has no organic relationship with this Purana and the only affinity that it shows to the latter is a minor one, namely, that the main speaker here also happens to be Brahma. 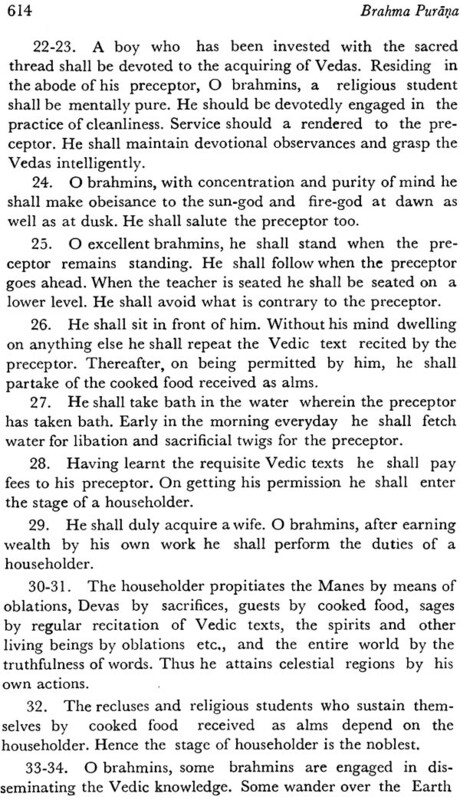 A very relevant thing to be noticed here is that it differs in style from the Brahma Purana. 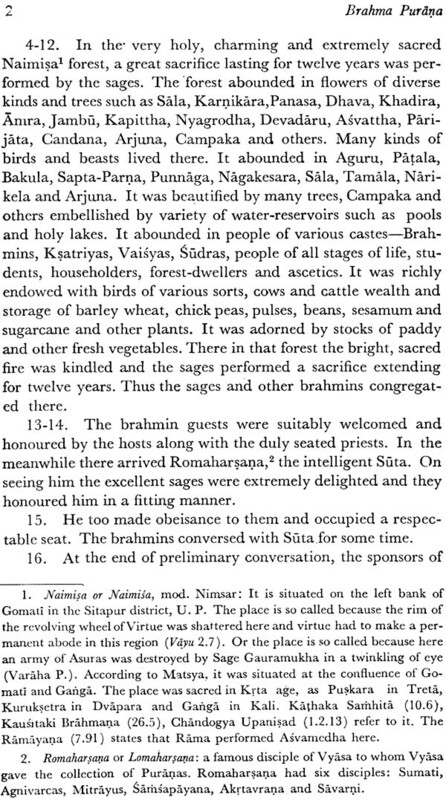 In each of its chapters it describes one Tirtha with the legends and anecdotes associated with it, how it got its name, what is its importance, what merits accrue from visiting it and offering worship etc. 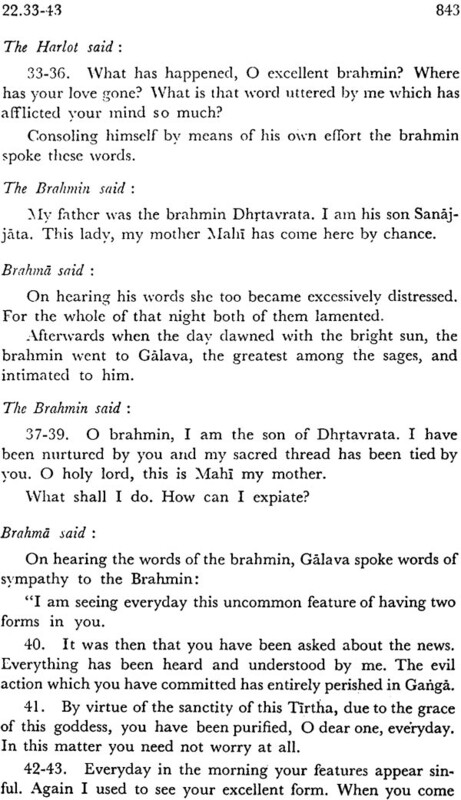 By all internal and external evidence the Gautami-Mahatmya appears to have been added to the Brahma Purana at some late stage. In the first chapter of the work some genera! 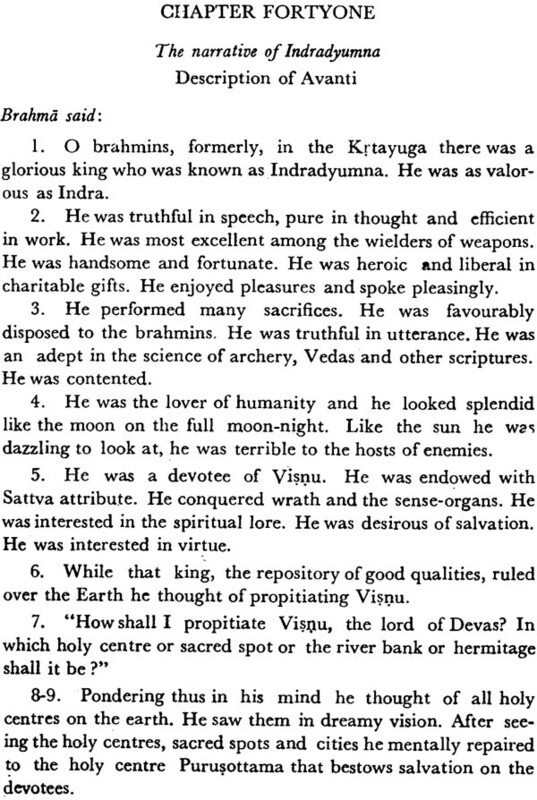 Features of the Tirthas, their varieties, nature etc. are described. 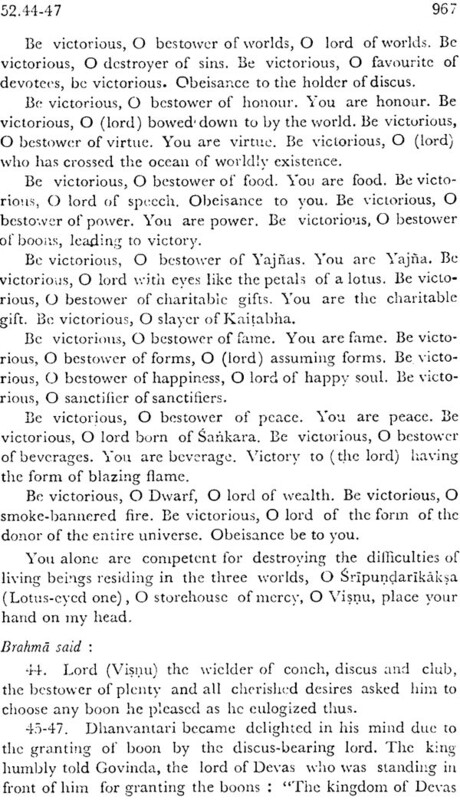 The second one relates the story of the demon Taraka, atrocities inflicted by him on the Devas, their prayer to Visnu for protection, the latter’s advice to them to persuade Lord Siva to marry the daughter of Himalaya with the aim of giving birth to a valiant sort *ho would kill the demon, the burning of the God of Love by the fire emanating from Siva’s third eye and the ultimate winning of his consent by the Devas to marry Parvati. 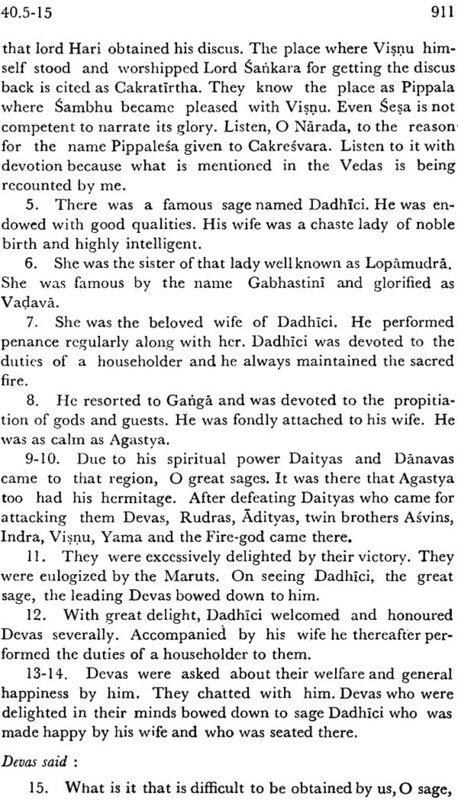 The third chapter describes the marriage of Siva with Pãrvati and the birth of Kãrttikeya. 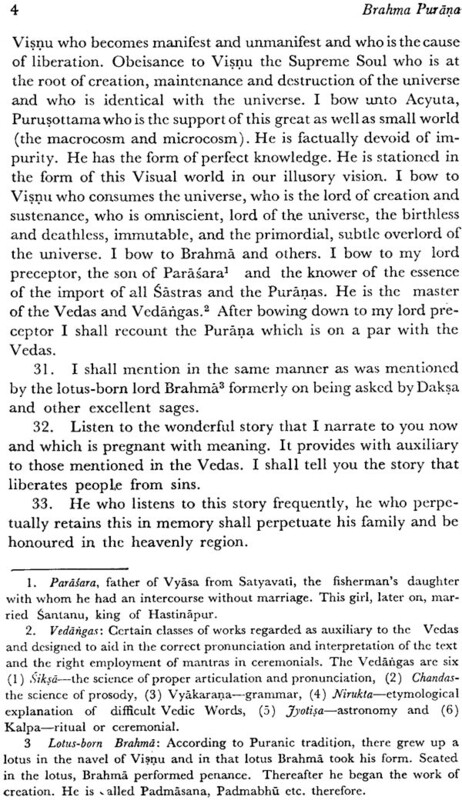 In the fourth chapter the story of Visnu’s incarnation as Vamana is narrated and also the origination of the waters of Ganga from the foot of Visnu washed by Brahma with the water of Kamandalu, and the bearing of the waters of Gangã by Siva in his matted hair. 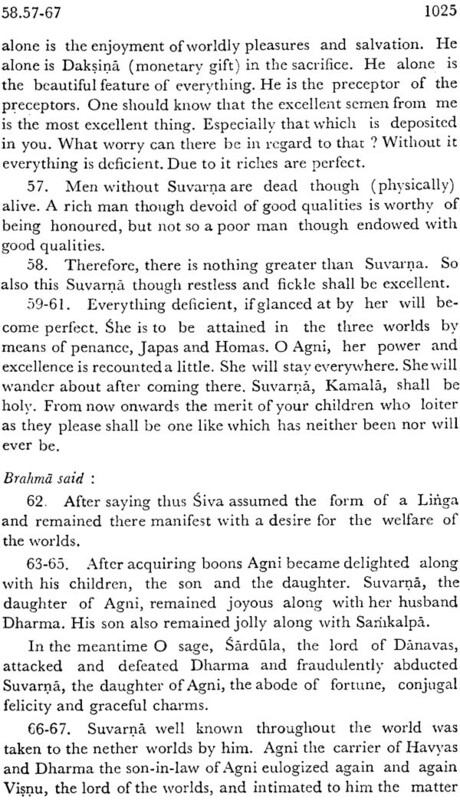 The fifth and next two chapters describe how Parvati gets jealous of Ganga due to her closer association with Siva how a plot is hatched up so that Siva Abandons her how the stage Gautama gets Falsely implicated and ultimately succeeds in bringing Ganga from Siva’s mattes air to Brahmagiri and from there down to the earth in the form of Godavari. 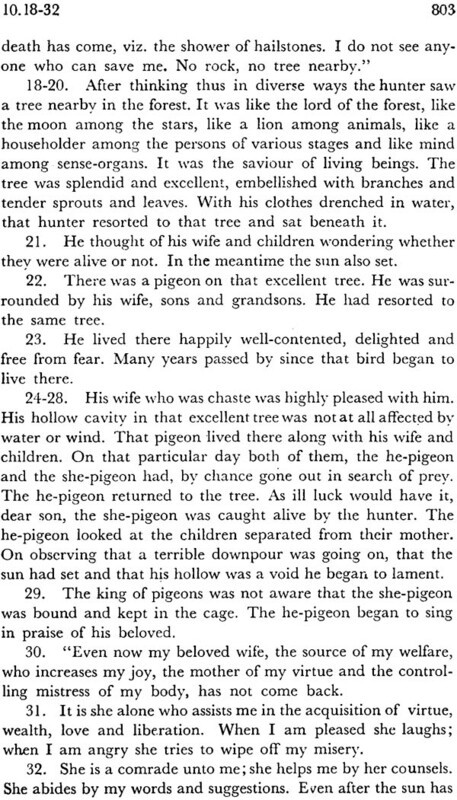 The eighth chapter narrates the story Sagara the burning of his sons by the infuriated sage Kapila and the taking the ancestors burnt by the curse of Kapila. 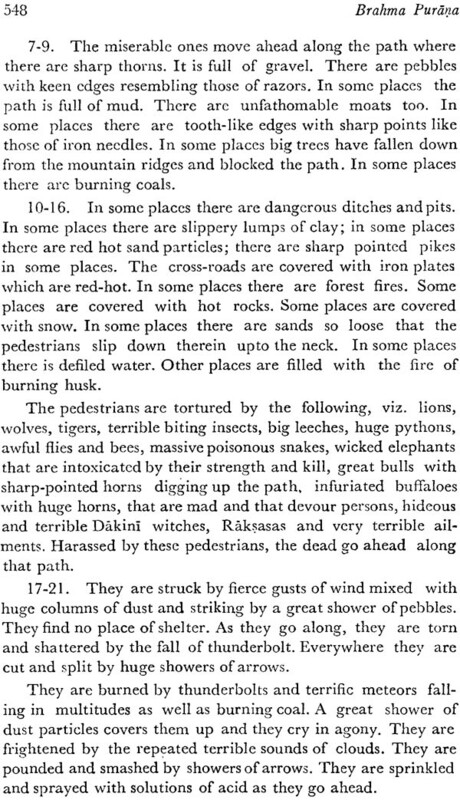 After this chapters 9-104 take up a detailed description of a large number of sacred places with associated stories. 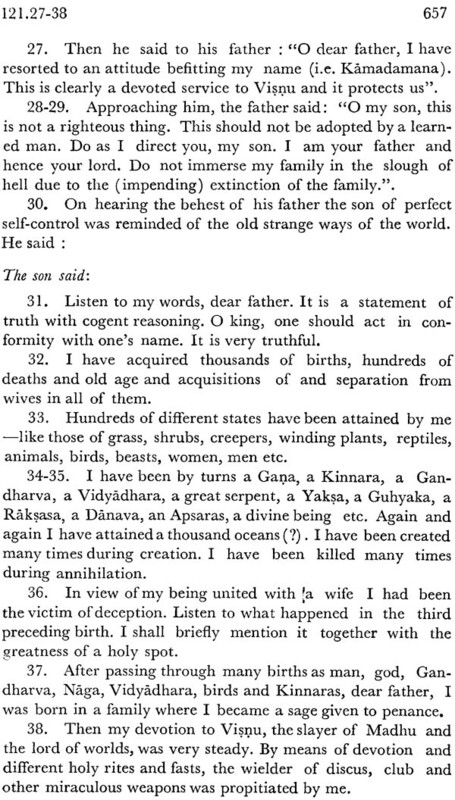 The last chapter repeats the story of Ganga brought down to the earth by the sage Gautama with the difference that he is not here falsely accused of cowslaughter and also the benefits of perusing and hearing the Gautama Mahatmya.